Beautiful, family friendly cabin in the mountains only 45 minute drive from downtown St. George. Get away from the heat and traffic and treat yourself to one of the most beautiful places on earth. This 3 bedroom 2 bathroom cabin has everything you need with large grass areas for games, horseshoe pit, fire pit, tall mature trees for added shade, and views to die for. Relax on the porch-swing and watch as wild deer and turkeys wander through the yard. 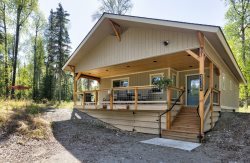 The cabin features an updated kitchen with granite counter tops, master bedroom with it's own TV and sitting area, living room with large screen TV, bunk beds for the kids, and free WiFi. Pine Valley is surrounded by hiking, biking, horse, and ATV trails, as well as Pine Valley State Park with a creek and fishing pond.